Describe an office. One of the words will be chair. It stands there behind the desk, ergonomically designed and perhaps on wheels for ease of movement in different directions. The chair is designed to offer a moment of relaxation to waiting visitors. On the terrace the chair is made of weather resistant materials. At the dining table it is designed to allow one to sit upright, but not for too long. A chair accommodates a seated person by means of a horizontal platform supported by legs. A vertical element lends support to the sitter’s back. Constructions without backrests are stools; constructions designed to seat several people at the same time are referred to as sofas. In practical terms, a chair should be light enough to be moved with ease. Comfort can be created with or without the use of upholstery. That the chair should not restrict the sitters’ movements and provide accommodation to many different shapes and sizes of people are also important concerns. The primary function of the chair is to facilitate a sitting position. Despite the various intentions of different kinds of chairs, the conventional sitting position is achieved by the sitters placing their legs in front of the chair so that their feet rest on the ground. A chair can also be designed in order to emphasize decorative aspects, express an idea, to have connections to an ideology, or according to economic theories. The design of the chair tells us something about the time and context in which it was made and used. When appearing in public, the king and the pope are carefully positioned and seated on well-upholstered seats. A plain kitchen chair is unthinkable. The voluminous dresses from the Rococo period matched the generous breadth of the chairs made at the time. Swedish Academy, one of the Royal Academies modelled after the Académie Française lists the members by seat numbers. Two members have chosen not to participate and since membership is for life their seats are described as unoccupied. Prisoners sentenced to death may still meet their fate in the electric chair, a motif used by amongst others, Andy Warhol. The art on display at Proventus is a selection on the theme of chairs from the collection Magasin 3 Stockholm Konsthall. In the collection, chairs appear: dressed in women’s underwear, floating in space, or worn and tattered, in works by artists Karin Mamma Andersson, Annika von Hausswolff, Maria Hedlund and Bruce Nauman. The latter’s work has political implications influenced by the newspaper publisher Jacobo Timerman’s destiny. He was imprisoned by the Argentine military in the 1970s and subjected to torture whilst strapped to a chair. 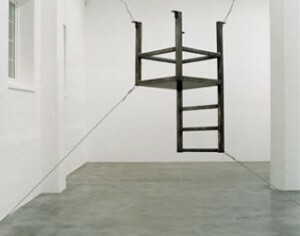 In his work Nauman flips reality up side down. There are also other artists represented in the collection that has worked with the chair. In her work ”Jardin Public” – a chair with a triangle of pubic hair sprouting from the seat Mona Hatoum makes a play on words. Tobias Rehberger made design drawings of Alvar Aalto’s and Marcel Breuer’s classic chairs. He then asked a carpenter in Cameroon to build pieces of furniture according to the drawings. The results are entirely different from the originals, hybrids that are neither European nor African. Rehberger’s chairs become artworks about translation. Temporary exhibitions, curated by Magasin 3, will be shown at Proventus approximately twice a year. Charles Long, "B.U.A. - Burnt Umber Assembly"
An Entanglement of Wholes, 1998 (Flocking over mixed media, sisal, foam rubber and sound equipment). John Bock, "film and parts from the installation Im AtomeiterzinsKonflikt mit einer EierstockCapitalSaint 2001, Performance at Magasin 3 Stockholm Konsthall on September 13, 2001"
Excerpts from an interview with Charles Long, made by Richard Julin, curator at Magasin 3 Stockholm Konsthall, NYC, 3 November 1999. When I was first working with Stereolab and I went over to visit them I went to the Museum of Mankind . They had a show of African vessels, made by women. The vessels had multiple necks coming out of the same thing. You could have a ritual with several people and they could all drink out of their own spout without contaminating the spirit of the others. At the same time there was a unity of a whole thing, the vessel. That became a good metaphor for me at the time. I was the vessel and Stereolab the elixir inside. The public engaging in it (B.U.A. - Burnt Umber Assembly: An Entanglement of Wholes), hooking up with headphones. They would all have separate experiences, but physically they were all connected to the same thing. I try to make things as familiar to organic, bodily form as I can and yet never refer to anything specific. These are layers of looking for ways to see things without preconception; to make abstract forms that don’t refer to something outside of themselves in order to help you see the body itself, see it as something abstract. Because I feel that this is a precious view. If you can afford moments of estrangement and wonder. If you’re just not trying to survive. It’s a spiritual experience. The B.U.A., for instance, works like that to me. It’s one form divided into two segments. They’re joined where they intersect. When people hook up to it, when the copper wire of the headphones connects the forms and people, it’s another way of hooking more forms onto it. You have these big, soft, brown forms and then you’ve got a person with clothing, different hairstyles and things like that. Conversation between Lara Schnitger, artist, and Richard Julin, 9 January 2005, Los Angeles. Richard Julin: Lara, you’re from Holland, travel a lot, have spent a longer time in Japan and currently live and work in Los Angeles. How important is the place you live in to your art? Lara Schnitger: I have a pretty restless mind but you have to stop in some place for some time. What is interesting to me about L.A. is partly that a lot of my travels over the years come together in this city. Los Angeles has so many different areas that are authentic to their foreign origin, as far as you can be within another culture. Like Little Tokyo near my studio, where you can go shopping in entirely Japanese stores, for example. After living in Japan for a year I learned what culture is to me. Before going there I had never thought more deeply about my own culture, but the shock of being in Japan showed me that culture is like a comforter. Like actually wanting to go to McDonald’s in Tokyo just to feel a bit more normal, because that’s a place you recognize. It’s that feeling of being uncomfortable that I like to use within my work. I want to continue to challenge myself and let things from outside influence me. And as I said, L.A. lets this happen in one place. Things come together here for me. For example there is a huge Buddhist temple life going on here. I love temples as places where art gets made, often in the most eclectic way. Churches I think are for painters and temples are great for sculptors, like me! Buddhist temples have great installations in them. In some of these temples people give water to the gods, but some times they end up giving Coca Cola or sake bottles. In a temple in Japan I saw Barbie dolls and Hello Kitty next to the old stone sculptures. I feel that our times are like that. L.A. certainly is. This mixture of things that makes perfect sense to me ties in with my hopes that art can somehow be universal. RJ: The next area in the show (My Other Car is a Broom, Magasin 3 2005) is probably the most dense. It’s filled with a number of new sculptures that you’ve made here in L.A., installed together with a selection of older works. LS: I see that area as this gang of weird creatures, kind of hanging out together. They create a little scene together. I work with collages of the fabrics in the pieces themselves and the pieces will collage together into a new tableau. That’s how I hope for it to work. The pieces are different characters. Some are more figurative, some more abstract. They’re influenced by people I see around. Like for example the sweater piece that’s in the show. A friend was talking about these wild housewives you see sometimes. They’re really big and wear amazing weird looking purple sweaters. They’re often seen as low class and ugly. I wanted to change the view of these ladies into something really beautiful. So I made this flower bouquet-like hourglass figure. John Bock, "film" and "parts from the installation Im AtomeiterzinsKonflikt mit einer EierstockCapitalSaint 2001", "Performance at Magasin 3 Stockholm Konsthall on 13 September2001"
John Bock was born 1965 in Gribbohm, Germany. He works with performance and is based in Berlin. His actions, or lectures as he sometimes calls them, occur in worlds that he himself builds using simple architecture and everyday objects that function as props in the actions. He takes part in the installations he creates, sometimes together with the public, and he is constantly developing his own language, both in speech and movement. This results in sentences such as “The existential macro existence radius is determined in the positivist snowy expanses of saying yes.” At the beginning of the 1990’s Bock’s work consisted largely of so called lectures in which he often used marketing diagram flow charts filled with neologisms and material that no company’s conference room has ever seen. There was clearly a link to economics, which is in part explained by the fact that Bock has a degree in the field. Later his performances have developed with larger and more elaborate stages, costumes and texts related to fields other than economy. Many performances have focused on fashion entirely. Theater has also started to play a larger role in his work. A central part of Bock’s work is that his performances are filmed and that these films are integrated as parts of installations. During the last years many of his films have developed into entirely freestanding works where no public performance has taken place. In the year 2001 John Bock was part of the exhibition Free Port at Magasin 3 Stockholm Konsthall with the site specific work Im AtomalterzinzKonflikt mit einer EierstockCapitalSaintwhich is now part of the collection of Magasin 3 Stockholm Konsthall. The first temporary exhibition presented at Katarinavägen 15 consisted of three works by Swedish artist Ulf Rollof. Born in 1961 in Karlskrona, Ulf Rollof currently lives and works in Stockholm, Sweden. He has participated in several international exhibitions, amongst other Documenta IX (1992), the New Dehli Triennal (1997) and the solo exhibition Seven Seas = 7C's at the Venice Biennale (1999). The artist says that his works are about "transferring that which is private to public spaces. The most personal thoughts, the most intimate things that one perhaps doesn't really want to talk about". Construction 1, 1999 was built for the project 7C's for the Venice Biennale in 1999 and is a tribute to the artist's father. – My father had recently passed away and I wanted to create a piece of art about the end of a life. My colleague, Johan Svensson, and I built a traditional Swedish house (Fäboden, with its characteristic sloping walls to provide protection from the melting snow) and then drove it into a concrete wall at 47 km/hour at a crash-testing institute in Linköping (VTI). The result can be seen in the DVD, Collisions, which was shown in Venice. It was an attempt, using my own tools, to communicate on behalf of my father, who had lost his ability to do so. After the collision, we repaired Construction 1 and gave it a distinguishing mark to show what the house had been through. On the threshold, a groove was milled and a goldsmith inserted some gold I had inherited from my father. – One speaks of "Container" in psychology. How do I characterise this total but yet unfathomable sensation of everything I would like to express? Something as physical as the image of warm milk the child is offered?